... tomorrow Mark Mills will (hopefully) come to the tea room and I'll tell him all about last weekend.... and we'll reminisce about 40 years ago... and before that. I meant to take a picture of the Mission Community Center, where we had Saturday's event. It's so much smaller than it used to be. On a different note, the next few days I'll be posting a few pictures of Laura and Ryan's wedding. They had originally planned the wedding for THIS weekend. I need to remember that... so I can appreciate this free time tonight and tomorrow. In closing I'll show you 3 pictures from the wedding day June 5th. The first one is wonderful. The next two are kind of revealing - on how I was having mixed emotions that day. No wonder I was so tired after the wedding. No kidding (about the emotions being exhausting)! I've looked through the wedding pictures about seven or so times now and I'm still not tired of them! You are still so beautiful, Nancy. And, I'm sure the wedding was lovely. Have fun visiting with Mark. Wish I could join you! 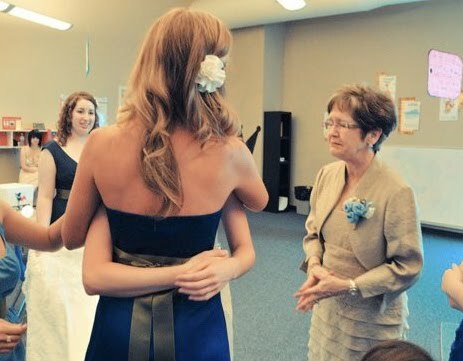 You were such a wonderful Mother of the Bride! And you will be a wonderful Mother of the Groom very soon! 2010: what a year! I'm a cryer to begin with, add a wedding or two to that, I'm sure I'll be a mess when it's my turn to be the mother of the bride or groom. And, like you, I'll love every minute, regardless of whether my eyes are leaking or not. Half the time I laugh and cry at the same time. 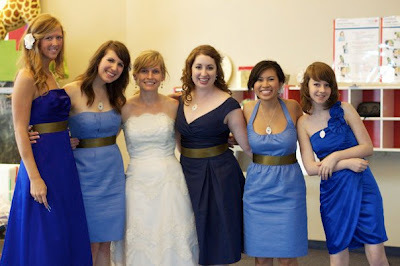 I love the photo's, love your dress too, Nancy! Beautiful.. 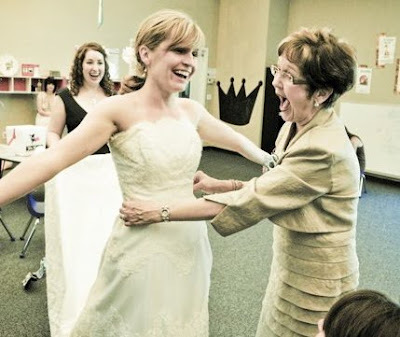 Mother of the Bride pictures..full of such joy..and Laura looks like the perfect bride..just beautiful!! So cute, Nancy! Sweet mother emotions. I love it!